Netherlands created more favorable conditions for a good start in the group sage for the UEFA Nations League and still got chances to stand against the group opponents for the first spot. The team is 4 points behind the leading France but still has another match to spare! Koeman’s men created the ambivalent impression of their performance. They occasionally deliver improved skilful game but remain unstable and leave a possibility to fail the match. Defence line is a weak spot here: they concede even against hardly the best opponents. The only exception is the confrontation against Germany ending by three goals to nil. Germany really underestimated the rival. Moreover, had some defence issues. The team won’t be an unconditional favorite against France, however, it’s far from being and outsider. France successfully accomplished the FIFA World Cup season, beating Croatia in the finale 4-2. They’re currently leading Group 1 League A with seven points after three meetings. However, they have no right to relax since another crucial match just around the corner. As we’ve stated above, France look amazing in attack and defence. They also perform the same brilliantly away and home. Though the squad won’t be in the number of favorites against Netherlands, but they surely know their place and do their best to gain only positive results. 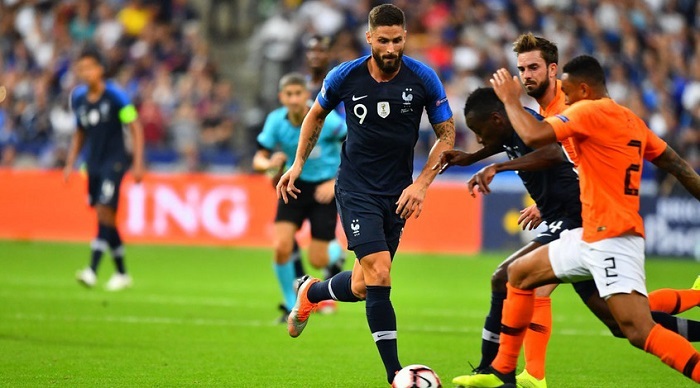 France are presently on a roll, when Netherlands seam to display a rocky game. Attacking line-up of France is just excellent, however the same cannot be said of their defence. This might be used against them in the upcoming match. France see this game very crucial as Netherlands still have another game on and may catch up on them. We’ll fancy a fascinating duel between two major national teams beyond any doubt. And at this point we believe the match to end up with a victory of France. Our bet H2(0) should pass respectively.